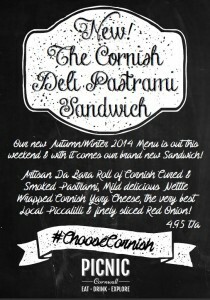 With September well under way our Autumn/Winter 2014 Menu will be out on Saturday 27th! There are some exciting things coming along with our new menu, and here is just a brief run down..
Over the summer we were delighted to discover a supplier of Cornish cured and smoked Pastrami! The perfect partner for our delicious Cornish Piccalilli from the experts at Sisley in Penryn & fantastic nettle wrapped Cornish Yarg Cheese! 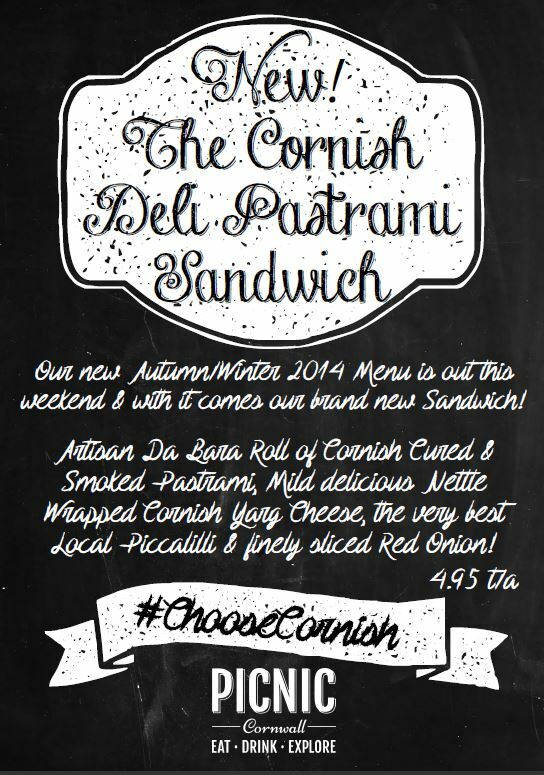 Served in an artisan roll from Da Bara Bakery with a sprinkling of finely sliced Red Onion, our Deli Special Sandwich is £4.95 to take away. We love Autumn and Winter and wanted our drinks menu to give customers some winter warming ideas alongside our popular coffees and teas. We are introducing a Trick or Treat Latte which combines locally roasted double shot espresso with Caramel & Gingerbread Syrups, and a Winter Warmer – latte steamed milk combined with decadent Chocolate Sauce and warming Chilli & Gingerbread Syrups! We know customers love our hot chocolate – we love hot chocolate too, and have given ours a bit of a scrumptious make over! Hot choc is made from a decadent mix of plain and milk Cornish chocolate buttons stirred in to steamed milk and topped with fluffy white Marshmallows and a swirl of Whipped Cream. SUPER-yum!